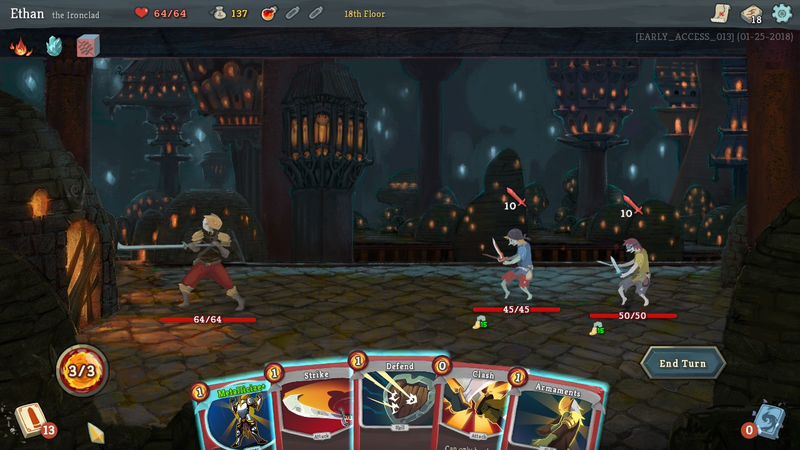 Slay the Spire, a roguelike where you try to deckbuild your way out of brutal dungeons, went into Early Access on Steam last November and has since been slowly winning over unsuspecting players who go into it with low expectations. I am one of those recent converts. Developed by Mega Crit Games, Slay the Spire takes RPG dungeon crawling and remixes it around modern card mechanics. At the beginning you're presented with a map of different rooms connected by meandering and intersecting paths. You choose where to start and then follow the path from one discrete room to the next. Usually, each node on the map is a fight that starts with you drawing five cards from your deck. From there, you have a limited number of action points that can be spent playing cards. Want to attack an enemy? Spend a point to play a slash card and deal six points of damage. Want to defend? Play a block card to absorb some of the next attack that comes your way. After each fight, you select the next room to enter, which might contain treasure, a merchant, or just more things to fight. Throughout all of it, though, you'll hopefully be accruing newer and better cards to make you stronger, all with an eye to being ready by the time you have to face the map's final boss. Since combat is based around deckbuilding, everything is resource-based. You'll only have a few cards from your entire deck in your hand each turn. All the ones you end up playing go into a discard pile until everything else is used up and it's time to shuffle them back into the mix. You might want to attack, for instance, but realise you don't have the right cards for a good combo, so instead you decide to block for a turn or hit the enemy with status ailments that weaken their attack or defence. At the same time, the amount of health you have rengerates very little from fight to fight, so not dealing with enemies as quickly as possible will leave you bruised and battered by the time you reach the boss. The tension between all of these things, in addition to choosing which cards to add to your deck as you adventure, leads to interesting tradeoffs and compromises that help invigorate a lot of the old RPG formula with interesting new wrinkles to think through. I used to love simple turn-based combat. Growing up, I surrounded myself with role-playing games such as Chrono Trigger on the SNES, Wild Arms on the PS1, and Final Fantasy 10 on the PS2. I've gone through the core combat loop of attack, attack, heal, attack more times than I can count. But today, I find that cycle excruciatingly boring. I still like customising characters and grinding to get them more powerful, but the battles themselves usually just feel like mindless busywork, best done while watching videos on my phone or listening to a podcast. Of all the things I loved about Persona 5, the traditional battle system was not among them. A lot of games have made strides to try and change that formula up (Ni no Kuni and Bravely Default come to mind), but so far Slay the Spire sticks out as one of the more extreme reimaginings that still feels balanced and not overly complicated. Blocking has been a mainstay of turn-based RPGs for decades, but rarely has that much utility. "You can't brute force your way through obstacles." 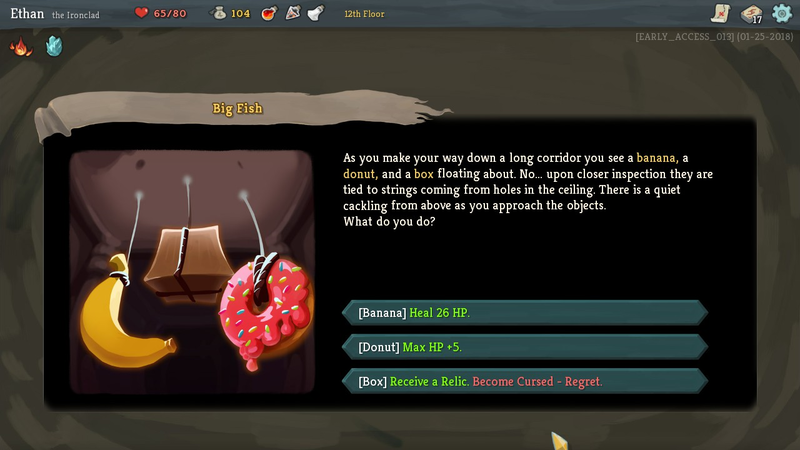 In Slay the Spire, however, blocking always has a numerical value attached to it, allowing you the option of building it up enough to fully negate all damage if you want. Similarly, because you know how much damage every action will do ahead of time, you can plan out moves and look for the best way to maximise damage like in Hearthstone or Magic: The Gathering. There's almost always a better solution than just pummelling away with straight attacks, especially as you progress and pick up more complex cards. By the end of the first map, I'd found an especially effective strategy revolving around a card that did a lot of damage but could only be used if there weren't any non-offensive cards in my hand. In order to satisfy that condition, I usually had to wait to draw a self-harm card that dealt four damage to my character in exchange for extra action points. I could then use the extra action points to clear out my hand, including playing a spell that made the next attack card strike twice, and thus paving the way to land a 20 damage hit. Combos such as this are both satisfying to pull off and fun to figure out. 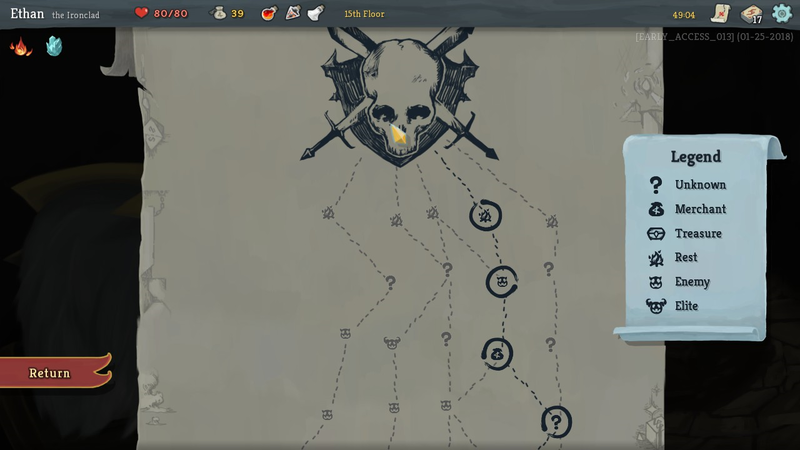 Slay the Spire isn't easy by any stretch though, so recognising the patterns that help them to emerge, both during combat and while building out your deck, is a necessity. In other words, you can't brute force your way through obstacles by simply loading up on potions and grinding until your character can simply overpower whatever it comes across. Currently there are only two characters you can select from at the beginning of each new game, thought the studio is currently working on a third, with more planned by the time the game leaves Early Access this winter. While one is more of a straightforward knight class, the other is more of a rogue archetype dealing in damage-over-time poisons. The rest of the game's third map is still under construction as well, although it will most likely take several hours with the game and a lot of failed attempts before you make it that far. 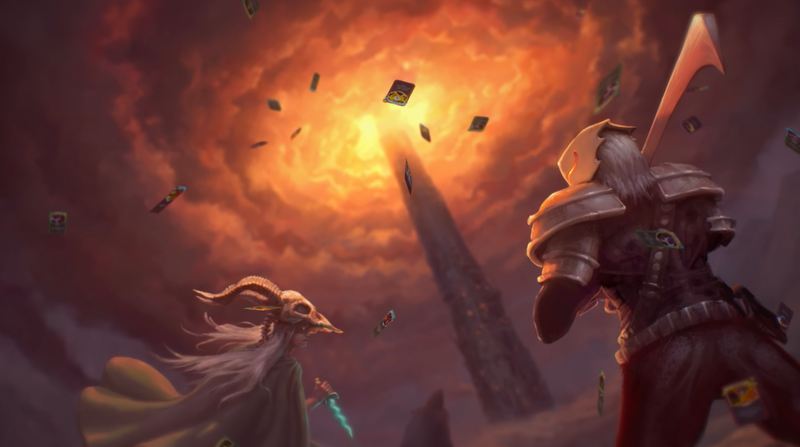 In the meanwhile, new cards, special items and extra game modes are expected in the coming months, while Mega Crit says it will start looking at porting Slay the Spire to other platforms once it is out of Early Access.